We called our activity “Say Yes to the Dress/Project Runway”. For what I call the “educational” part of the activity, we reviewed what the clothing standards are in For the Strength of Youth. We talked about why the standards for a dress you would wear for getting married in the temple is different than most wedding dresses you see on TV/movies, etc. We talked about what a modest wedding dress looks like (got into specifics of neckline, etc because this would relate to the dress-making part of the activity). I also shared some quotes that I found in an article about how becoming more spiritually mature and gaining a testimony turns standards from being an annoyance to being a welcome part of our lives. We have a number of young women who would rather be fashionable than modest, so I hoped that this would help them understand that the standards are a positive thing that they may choose to embrace as their personal testimonies grow. The talk, titled “Making A Mighty Change” by Marlin K. Jensen can be found on lds.org here. I tried to keep it positive and encouraging. and we briefly discussed how the bride had been disappointed in her simple wedding dress and lack of fanfare surrounding her wedding day, but the most important part of her marriage was who she was marrying and where she was being married. Finally, I showed photos of brides from 3 recent weddings (in the past year or 2). 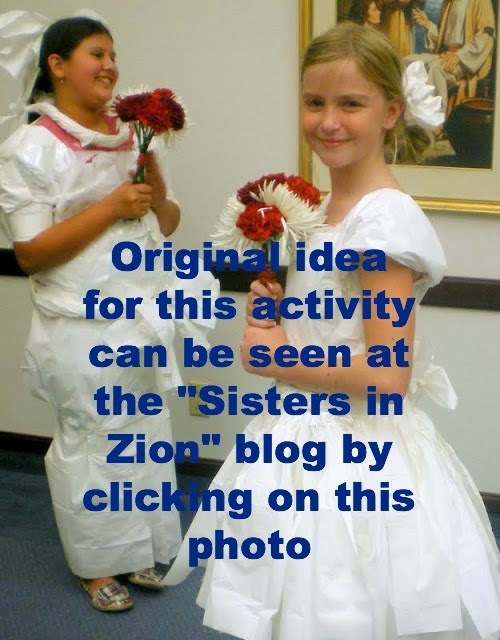 I chose young and fashionable brides that the girls would know (people who are/were in our ward or stake) and each of them was gorgeous and had a beautiful (and modest) wedding dress. I specifically chose photos taken in front of the temple. The girls ooooo’d and aaaaaaaah’d over the wedding dresses and I hope it helped make the point that modest can be glamorous and beautiful. Then the time for the competition had finally come- we split the girls up into teams of 4-5 and had them go to separate classrooms to work. They were each given 1 roll of clear packing tape, 1 roll of white paper towels, and about 100 white paper napkins. I bought the cheapest materials possible, so the cost for the dress supplies (for 3 teams) was about $9 total. Don’t forget that they will each need a pair of scissors for the tape- I forgot scissors and we had a hard time finding enough pairs at the last minute. I think all of the brides wore their dresses home – it was a lot of fun! Can’t have a wedding without cupcakes and punch!